This was a super quick and fun card to make. I wanted to combine lots of the graphic elements onto one card. I think I accomplished that. 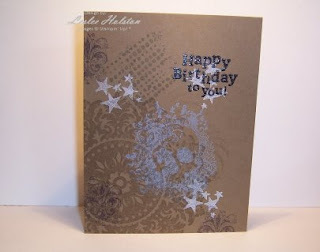 Yes, this is a no layers, no embellishments card! Very odd for me. I wanted the graphic elements to make the card. This card sports Extreme Elements, Medallion, and From the Crypt. Can you spot them all? I started with the beautiful Soft Suede card base. I stamped the Medallion in VersaMark in the lower left hand corner. I then added the various elements from the Extreme Elements set. I changed the ink color with each stamp...the fleur-de-lis in Close to Cocoa, the winged element in Saraha Sand, the dots in Soft Suede, stars in Whisper White, and the skull (in the From the Crypt set) in Bordering Blue. All inks are craft (except the Soft Suede, Sahara Sand and VersaMark). I wanted the elements to layer onto each other...not blend into one another. I drew inspiration from my young man's graphic T-shirt (of all things). I noticed how the elements are mostly subdued and monochromatic...except for one. That one focal element is in a bolder, yet complimentary color. That's why the skull is in Bordering Blue. 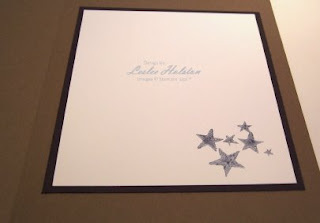 The birthday sentiment from Birthday Wish is heat embossed in Basic Black and Black EP. I had to emboss it to make is stand out on the card. That's where I have my layers and more star elements in Bordering Blue. This card received rave reviews from my boys. Gosh, I love hearing them lovin' my cards! It is very hip, cool and extremely masculine. What do you think? Thanks for looking! May you find inspiration in places you didn't even think to look! Come back soon.